Confession: one of the girls in my Girl Scout troop doesn’t know my name. She keeps calling me “Miss Lovato” and I just stopped correcting her, because I’m totally fine if she gets me confused with Demi Lovato. If any of you have been following the Team Selena/Team Demi nonsense, it’s hard not to think that Selena would be the pretty clear winner of that fight. She’s dating Justin Bieber and is on the cover of Cosmpolitan. And I make no secret of it: I love Selena Gomez and listen to her music all the time. But let’s not forget Demi! She’s been very open and honest about her eating disorder and her anger management problems and her self-harm. Life as a teen idol can be tough, but I think it’s cool that she’s talking about it. Selena Gomez is, let’s face it, pretty much a perfect human being. Demi’s not, and, well, neither are most of us. Her comeback song, “Skyscraper,” is not my personal favorite. But it seems to speak to a lot of teens, especially ones who have been/are being bullied. (The top comment on that video right now is: “I’ve been through a lot these past months. Demi helped me. She almost saved my life. She is the reason why I didn’t kill myself. She is the reason why I’m still breathing.Thank you Demi. Thank you for everything you did. You’re an angel.”) So good for you, Demi. Last week for my children’s nonfiction class, we had to read two books about the kakapo, an endangered New Zealand parrot. Neither of the books, strictly speaking, were YA books, but they were both great and the kakapo is an amazing bird and I am going to blog about it. So there. 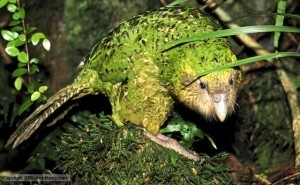 Kakapo! Here are some facts about them. They are the only nocturnal, flightless parrots in the world. They naturally smell like honey. There are only 127 known kakapo left in the world. So, the first book we read is a children’s book, Kakapo Rescue: Saving the World’s Strangest Parrot by Sy Montgomery and Nic Bishop. These two have written other books in the Scientists in the Field series, and they generally know what they are doing. 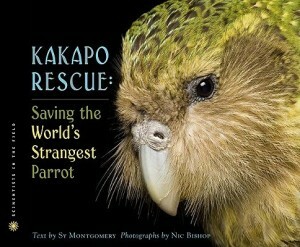 Kakapo Rescue won the Sibert Medal (which is the ALA’s award for children’s nonficton.) There are great photos of the beautiful kakapo, and I love that these two got to spend 2 weeks on Codfish Island, the kakapo’s reserve. They documented their visit, including tagging along with the various scientists and volunteers who live on the island to monitor the kakapo. They also highlighted several of the kakapo, so you get to know a bit about the birds’ personalities. It also has sidebar information about the history of the kakapo’s brink with extinction. It’s a very well-done introduction to the kakapo itself and current conservation efforts, which are heartwarming–people giving up their jobs to volunteer as full-time kakapo minders. The volunteers and paid scientists alike are clearly extremely passionate about these birds, and it’s hard not to feel the same. 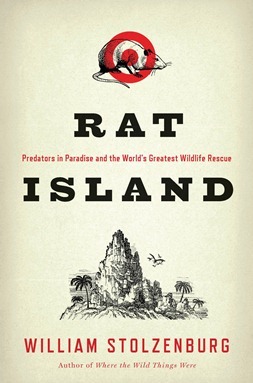 Rat Island: Predators in Paradise and the World’s Greatest Wildlife Rescue by William Stolzenburg is a very different book. It’s an adult popular science book, though a motivated high schooler could read it too. It’s not just about the kakapo–it’s more broadly about the way island ecosystems encourage the evolution of weird animals like the kakapo, who are pretty much helpless to foreign predators like rats and cats. He talks about how amazingly difficult it is to get rid of rats. Like, so hard, guys. So before Kakapo Rescue could even take place, SOMEBODY had to kill a billion rats to create a safe island for the kakapo. Rat Island also gives much more information about Richard Henry, the first conservationist to pay much attention to the kakapo. He tried to gather up a bunch on to what he thought was a safe island, but somehow a weasel got there and killed most of them. Then Richard Henry tried to kill himself, but failed. Twice. So he gave up on suicide. Poor guy. Anyway, I thought Rat Island was completely fascinating, but fair warning: pretty much everyone else in my class hated it. (We all loved Kakapo Rescue.) Their complaints: no photos (I mean… it is a “grown up book”…), too much information, and jumps around a lot in time. This is all true, I guess, but it’s such a crazy story! Oh, and also, this guy Bill Wood trained Wishbone’s grandaughter, Freckles, to help him eradicate feral cats in the Baja islands. WHAT. Finally, here is a BBC video of Stephen Fry making jokes while a kakapo tries to mate with Mark Carwardine’s head. SAVE THE KAKPO PLEASE. For more kakapo information, check out the Kakapo Recovery Programme. Do it. Overall, I rate the kakapo a million stars for being so cute and amazing. These two books about them are pretty good too. Last week I was perusing Give Me Something To Read and came across an article entitled “The Devil in Greg Dark.” I started reading it and was confused to see that it was from 2001–Give Me Something to Read usually posts recent articles. But I quickly realized that the article was really about Leslie Carter, who died a few weeks ago at the age of 25. I didn’t remember Carter’s music from my own tween years, and I learned that her full album was never released. The whole thing is pretty awful and makes Leslie’s early retirement seem entirely reasonable. Interestingly, the Village Voice called Leslie’s unreleased album the best bubblegum album of the entire ’97-Y2K era. 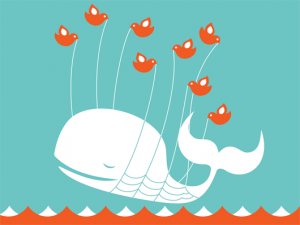 Posted in Uncategorized | Comments Off on Music Monday: Like Wow! Okay. 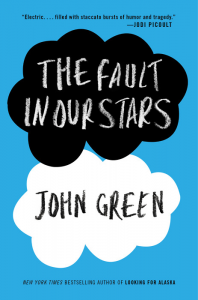 There’s probably no point in me reviewing The Fault in Our Stars by John Green since by now it’s been a NYT bestseller for a couple weeks in a row (not to mention that it was also a bestseller in pre-sales) and you’ve probably already read it. But nevertheless, I read it and I have thoughts about it. I have heard the complaint leveled that John Green is overrated. And, to some extent, I think I agree. Or at least–I think that his Twitter and his YouTube videos make me feel more fondness toward him as an author than his books alone merit. Is that the same thing as being overrated? Or is he just good at social media? Is that the whole point? (Maureen Johnson also triggers this confusion in me.) I think that John Green is excellent at social media but I think he is also excellent at writing books, and I will happily consume both. 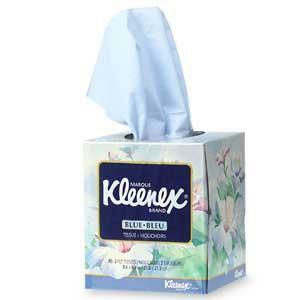 Still, I was nervous about The Fault in Our Stars (or TFIOS, as the internet calls it). I mean, it’s about cancer kids. 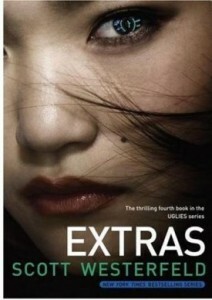 And Jodi Picoult wrote the cover blurb. Let’s be real: it could have been cringe-worthy. But instead, I really thought that it transcended cliche and delivered wonderful characters and, you know, deep truths about mortality or whatever. TFIOS was so engaging that it cured my jet lag. The first day I got back from my European travels, I went to bed at 8pm and woke up at 4am. It was less than ideal. The second day, I picked up all my held mail, including my pre-ordered copy of TFIOS. 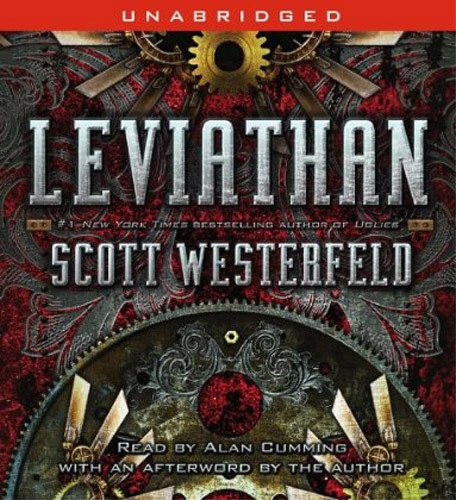 I decided to read a few chapters of it before going to bed at 8:30pm, a totally reasonable bedtime for a jetlagged grownup. 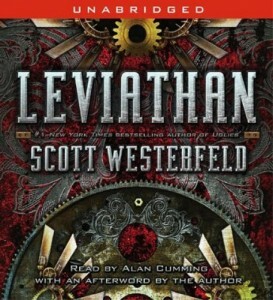 But I got so sucked into it that I read it straight through until midnight. Then I wiped my tearstained eyes and went to sleep. Ahh. So. 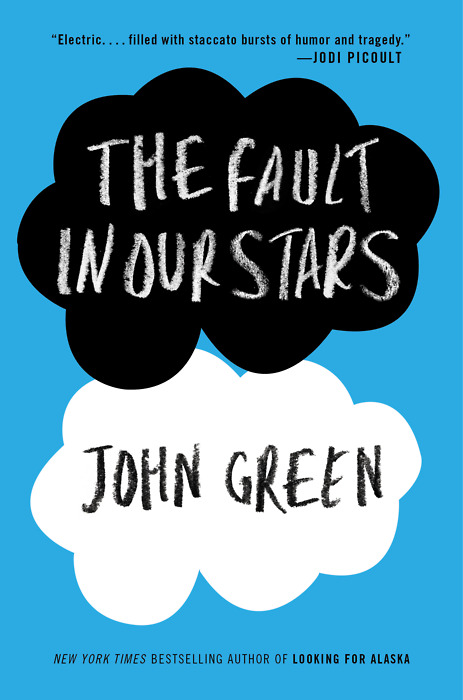 TFIOS is the story of Hazel, a teenage cancer patient. Hazel loves the (fictional) book An Imperial Affliction, which is about a teenage cancer patient. She dislikes most of the kids at the teenage cancer support group her parents make her attend, except for Isaac, a sarcastic eye cancer patient. And Isaac’s friend, Augustus. Before long, Hazel more than likes Augustus. She loves him, and vice versa. But Hazel knows her days are numbered, even if she doesn’t know the exact number, and she’s afraid to let Augustus get too close to her. I don’t want to give too much away, but, you know, it’s a book about cancer kids. It’s funny and heartbreaking. Don’t put on mascara before you read it, that’s all I’m saying. 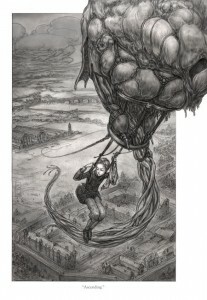 These characters have a unique perspective on life and mortality, and Green–who worked as a chaplain in a children’s hospital–brought them to life unforgettably. As is true in many of my favorite YA novels, the teens talk perhaps a bit more intelligently and profoundly than normal teens. Like, whatever, at least they’re not vampires, am I right? Jessica’s drunk toast was also amazing. Actually, all of the toast were amazing, except for Edward’s. The problem with Twilight is that Bella and Edward are the very worst, most boring characters, and yet tragically they are the protagonists. Sigh. Anyway, their bed-breaking honeymoon was pretty much exactly as horrifying as I hoped it would be. 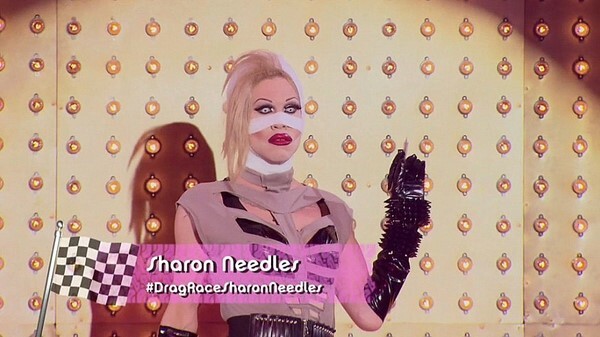 I also felt that their horrified maid was a perfect avatar for the audience. Seriously, what even?! … and yet the movie focuses on Edward, who spent his free time as a vampire learning every human language and watching Bella Swan sleep. What-ever. Oh, also, I liked how in the movie all the other characters acknowledge that “Renesmee” is the dumbest possible name for a baby. I also give props to the movie for showing that Jacob pictures Renesmee as an adult when he falls in love with her. That makes the whole imprinting thing less creepy, right? Or, wait, more creepy? I just don’t know. 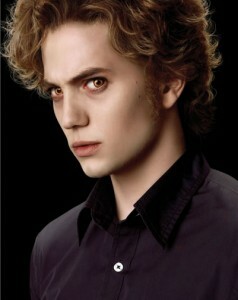 In conclusion, Breaking Dawn Part 1 did the best it could with its source material.